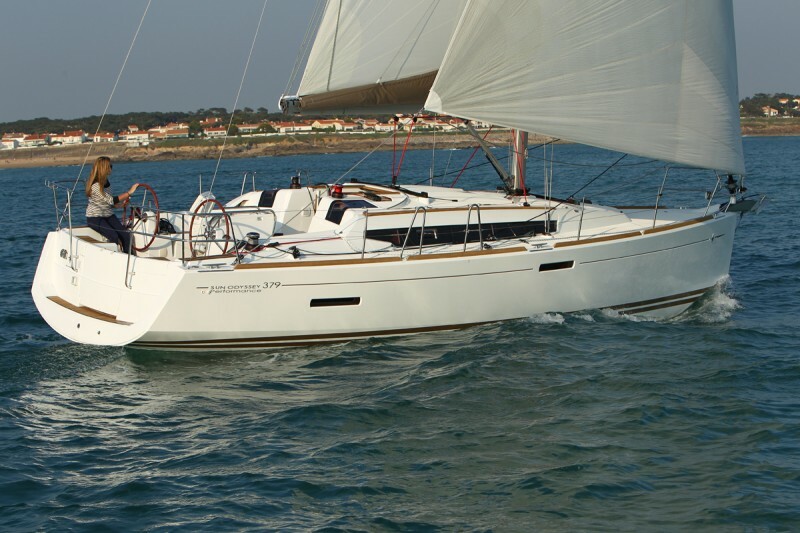 I had a feeling that the Marc Lombard-designed Jeanneau Sun Odyssey 379 would be fun to sail even before I took one out in 20-to-25 knots of breeze. That’s because I’d sailed the first of the similarly re-designed Sun Odysseys—the 409—last year, and it wasn’t hard to imagine the folks at Jeannueau serving up all the performance and comfort of the 409 in a slightly smaller, 37-foot package. But nothing I’d experienced on the 409 could have prepared me for the sheer joy sailing the 379 in a stiff wind. And my positive sailing experience was even more remarkable because the model we tested was equipped with the shoal draft wing keel that only draws 4 ft 11 inches. How is a “joyful” upwind sailing experience in over 20 knots of breeze on a shoal draft boat possible you ask? Simple. The 379 I was testing was equipped with twin rudders (along with twin wheels) and a well-designed keel. We also tucked in the first reef and took in a couple turns on the headsail. The wind was whipping, and boat has a pretty steep heel in the puffs, but the helm was always light and refreshingly balanced thanks to the leeward rudder that’s always deep and perfectly positioned to provide positive control. There was no fighting to keep the boat from rounding up and there was just the perfect amount of weather helm. I’m sure the boat’s hard chine aft also contributed to its superior control at bigger heel angles in the puffs. I’m also pretty sure that the deeper-keel, single rudder option will probably produce slightly better tacking angles, and be slightly quicker due to less wetted surface, but I’m sold on the magic of twin rudders. All other sailing performance metrics seem a bit mundane in light of the 379’s stellar upwind performance. We accelerated up to 7.5 knots and then hovered close to that speed on all points of sail. Visibility was excellent from the dual helm stations. The cockpit table provided excellent brace points for the crew and well positioned, molded-in wedges behind each wheel provide excellent footing for the helmsman, even at steep heel angles. Singlehanders and Wednesday night racers will like the German mainsheet system that makes it easy to trim the main from either side of the cockpit, and the jib sheets that lead back through stoppers to winches adjacent the helm stations. But, as with all boats set up with the main sheet and a jib sheet often needing the same winch (or for one sheet to be locked off in a stopper—not ideal if you need to ease quickly in an emergency), tacking and gybing can require some planning. Shifting sheets on the winches when we needed to do a controlled gybe in the 20-knot breeze was doable, but I’d have been easier if the mainsheet had simply been routed to a cabin top winch. Otherwise, the deck lay out worked beautifully. I liked the wide cockpit, comfortable seats, and the large retractable swim platform. When it’s open, the swim platform significantly increases the cockpit deck space makes it super easy to board the boat from the stern and it provides a wonderful sense of security in the cockpit when it’s closed. It also has a clever purchase system hidden under the port helm seat. Good sized lockers under the cockpit and helm seats will swallow fenders, dock lines, and other gear. The chart plotter rotates to be easily visible from either helm station and the other instrument read outs are right where you want them by the helms. I also appreciated the double bow roller, windlass, and deep anchor locker. But most boats deliver those essentials. In my opinion, what distinguishes the 379 (along with its excellent sailing performance) is the fact that the chines, the hull ports, the narrow tinted windows in the coach roof, the wide stern, plumb bow, and even the synthetic, maintenance-free, teak toe rail (that I honestly thought was real) all work in harmony to produce a truly attractive boat with clean modern lines. 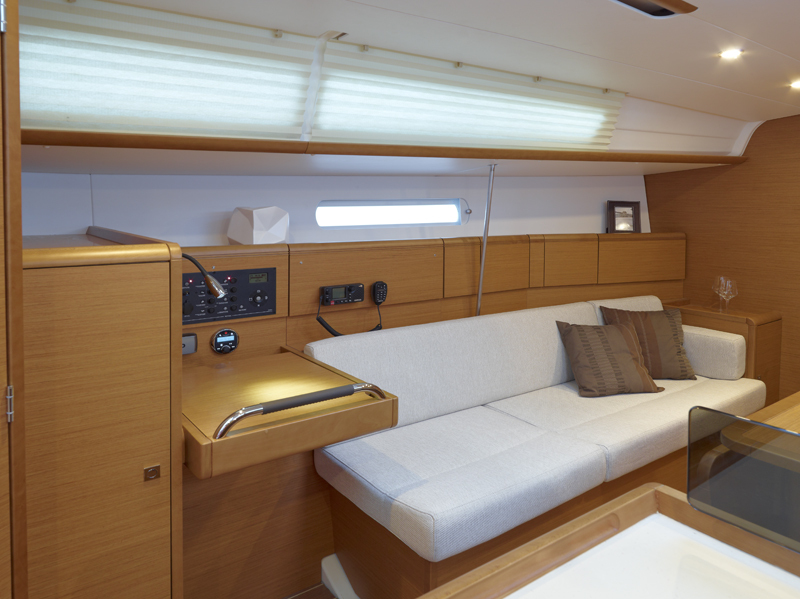 The boat’s clean, modern aesthetic is logically carried down into the accommodation plan. The main saloon features a large settee, a good-sized head, and an L-shaped galley at the foot of the companionway stairs. The light colored varnished woodwork and white headliner help the space feel warm and open, while a single opening hatch and two small opening ports provide ventilation. The long, straight settee seats can double as functional sea berths and the aft-facing chart table is big enough to handle a chart kit. Well-placed hand holds in the headliner and along the coachroof provide security when you need to move around while under way. 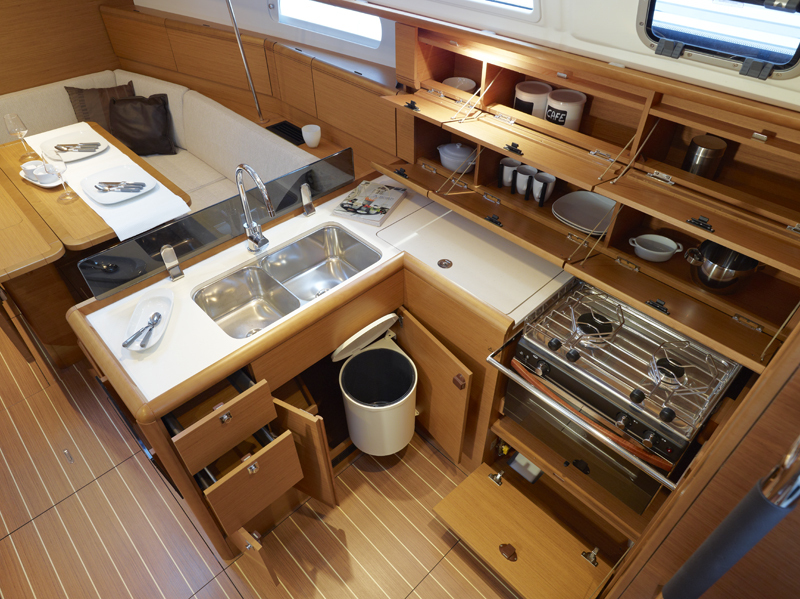 The galley has plenty of counter space and copious stowage and the single head has all the essentials, including a separate shower stall. If it was easy to forget we were on a 37-footer in the main saloon, it becomes more apparent in the sleeping cabins. 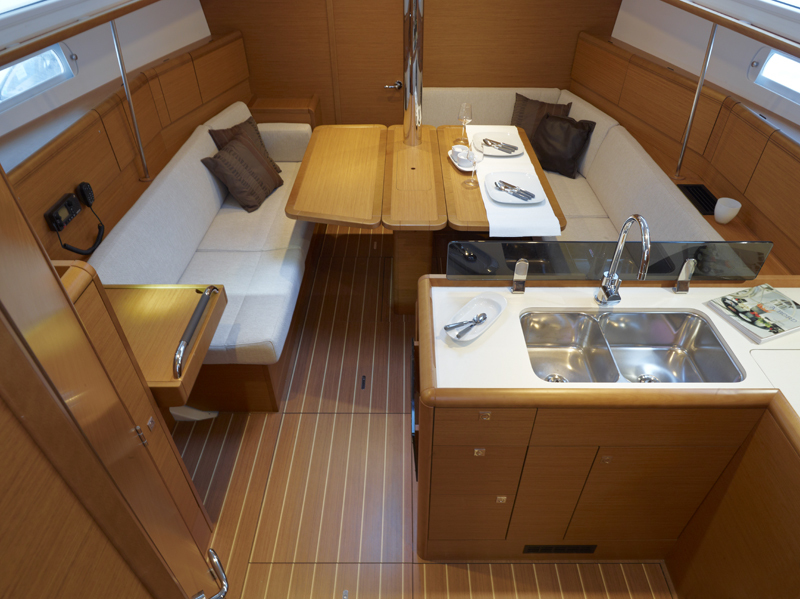 The forward cabin has a V-shaped berth and limited standing room that forward cabins on most sub-40 footers usually have. That said, it’s a perfectly comfortable cabin for two. There’s good lighting, plenty of stowage, and decent ventilation thanks to an opening hatch. 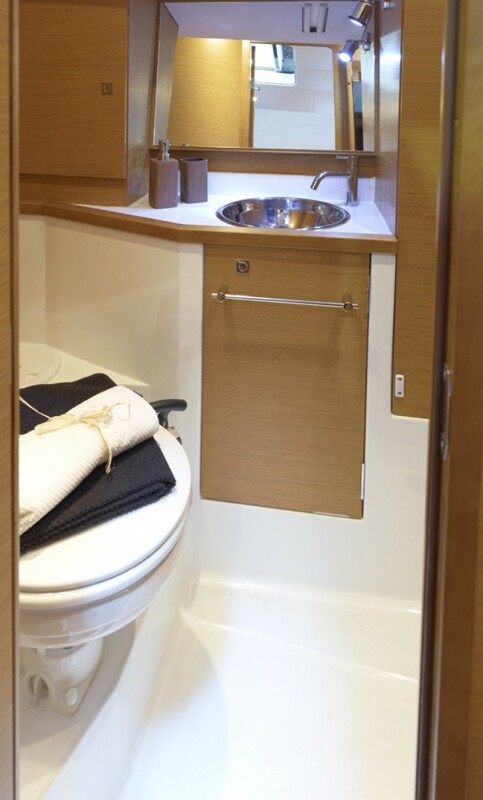 The guest cabins aft have larger rectangular berths but more limited ventilation. We had so much fun sailing, I almost forgot to record the engine data. But I can report that the standard 29 horsepower Yanmar performed well. We were able to get up to 6.5 knots of boat speed powering into the stiff breeze at full throttle (3,500 rpm); speed was about 5.5 knots at 2,700 rpm. Engine noise was obviously noticeable in the main saloon, but not absurdly so. It was a bit tricky backing into the slip in the stiff cross breeze, but the boat behaved beautifully in close quarters. Lots of boats call themselves be good looking and rewarding to sail. And lots of boats are designed to be comfortable at sea and in port. And still more boats try to do all these things in less than 40 feet of LOA. But after my test in over 20 knots of breeze, I can honestly say that the Jeannueau Sun Odyssey 379 comes closer to accomplishing all these goals than most. It was a blast to sail. It was easy to sail. It was comfortable to sail. It’s accommodations plan was spacious and stylish. And to my mind, Jeannueau is helping define what a modern cruising boat should be. What more could you want? Bill, did you sail the shoal draft 4’11” or the centerboard with variable draft model with twin rudders? You refer to the twin rudders in your article, but make no mention of variable draft.